This week in Canyon Country East we had 13 Part-1 crimes. Of those reported crimes, there was; 1 assault, 5 residential burglaries, 4 larcenies, 2 vehicle burglaries and 1 stolen vehicle. Domestic violence between a wife and husband occurred in the 26500 block of Oakdale Lane. A residential burglary occurred in the 29300 block of Abelia Road. Suspect(s) entered the home and stole electronics. Garage burglaries occurred in the 27900 block of Tyler Lane, the 27500 block of Marta Lane and two in the 18000 block of Saratoga Lane. Suspect(s) entered the garages and stole personal items from the unlocked vehicles. A larceny occurred at the Shell gas station on Soledad Canyon Rd. A male stole 2 20oz Gatorade’s from the outside locker. An IPhone was stolen after it was left unattended at the park on Oak Springs Canyon Road. Vehicle burglaries occurred in the 27500 block of Sierra Highway and on Jakes Way and Sandy Drive. Both vehicles had their windows smashed but nothing was taken. A 2001 Harley Davidson motorcycle was stolen from the 28100 block from Oak Springs Canyon Road. There were 7 arrests made by proactive deputies for various narcotics violations, assaults and public intoxication. This week we have seen an increase of residential burglaries. In most instances entrance is being made through the garage. Always lock your garage doors! If a key pad is used to open the garage, make sure to change the code periodically. We have also seen in increase in vehicle thefts and vehicle burglaries. Make sure to always park in well lighted areas and be cognizant of your surroundings. If you see any suspicious activity either close to your home or while you are out shopping, call the Sheriff’s station at (661) 255-1121 or 9-1-1 in an emergency. For up to date information follow us on twitter and like us on Facebook. 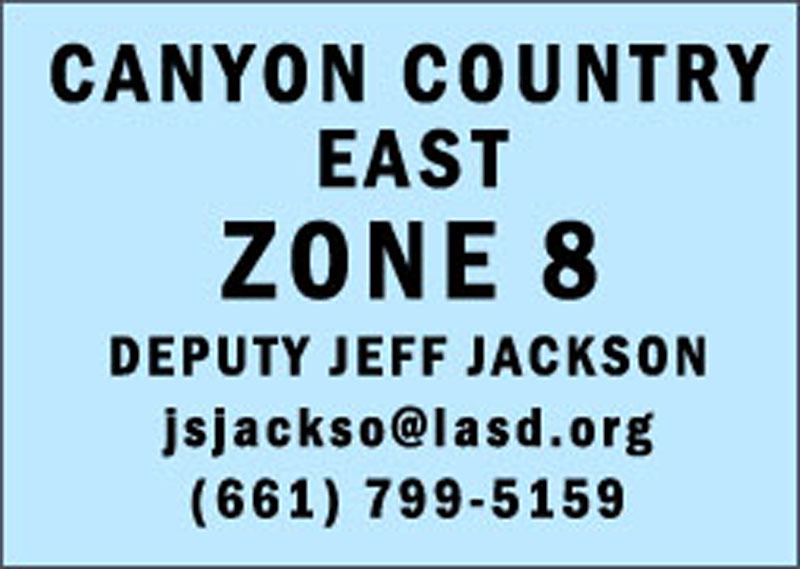 If you have any questions or concerns regarding Zone 8 (Canyon Country East) please feel free to email or call me directly.